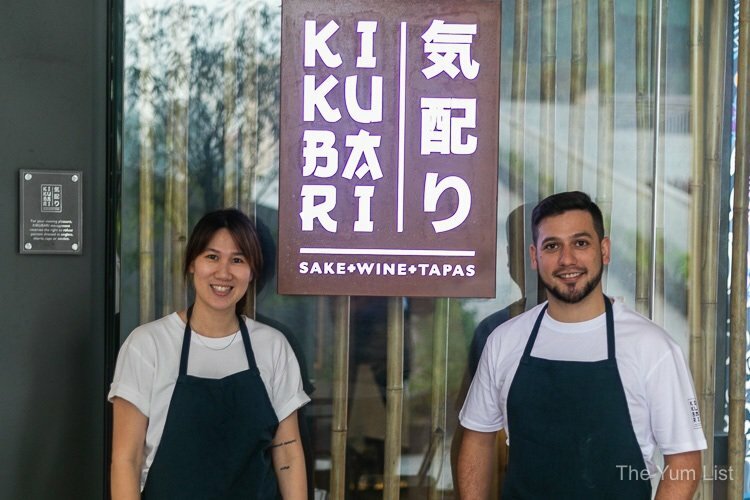 Celebrity chef Nik Michael Imran and chef de cuisine of Kikubari, Jun Wong, join forces to pay homage to all-time Malaysian favourites with their original take on them. For the week of September 17 – 22, 2018 the dynamic duo is presenting a special five-course menu priced at RM318++ per person and additional RM168++ for sake pairing. We’re here on the first night of the promotion and it’s clear from the start that this is going to be an interesting meal. The chefs, each extraordinarily likeable but opposites in their face to the world, are sure to bring some interesting accords. Chef Nik, confident and charming, is at ease in front of the camera and seems to have a relaxed, life-is-wonderful effortlessness about him. Chef Jun, a little more modest with the lens, has her own quiet self-assurance with her culinary mission clearly communicated and a delightfully humble appeal. Confession. I don’t understand half of the menu! Give me Italian, Spanish, French and I can work it out but Bahasa mixed with Japanese and some local humour thrown and I’m totally lost. Thankfully, service at Kikubari is second to none and I have more than enough assistance in translation. 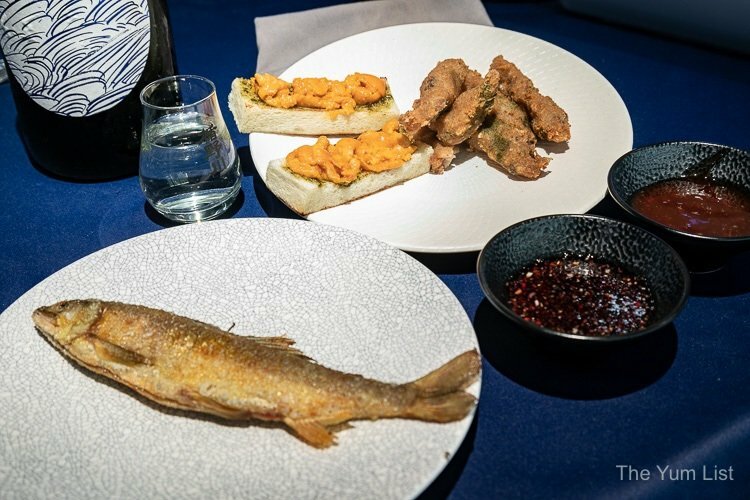 Snacks come in a trio of finger bites: fish crackers, deep-fried fish and sea urchin toast. Masaba keropok lekor with tonkatsu lekor dip uses Japanese mackerel as the base for a fish cracker (soft not the dry crisp style) with a thick spicy Worcestershire style sauce for the dipping. The second snack is a whole fried kunyit ayu. This is a sweet Japanese fish only available for a few months a year and caught in the most intriguing of ways. Fisherman allow birds to first catch the fish and then take the fish out of their mouths before they have a chance to swallow! No joke! I thought Japanese sommelier Yuhei was pulling my leg but he whipped out a YouTube video to prove it. It’s lightly seasoned with turmeric and accompanied by a seductively umami-rich but nonetheless local chilli shallot sweet soy sauce dip. Lastly, sea urchin lushes us the humble roti bakar with its strongly flavoured topping turning a humble buttered bread into a rather decadent fine dining bite. Hikoichi Junmai, a sake from the south-east of Japan, makes a fitting mate with its light, dry characteristics. A Japanese twist on a cherished Malaysian salad is the shungiki edamame ulam. Spring chrysanthemum leaf, young soybeans and sakura ebi (petite fried cherry blossom prawns) paint the dish with a Japanese brush. Kuromitsu (black caramelized sugar – black duke from the south of Japan) is blended with coconut and peanuts to form a sweet and more-ish seasoning. It’s recommended to toss all of the ingredients together and top it off with a squeeze of lime. 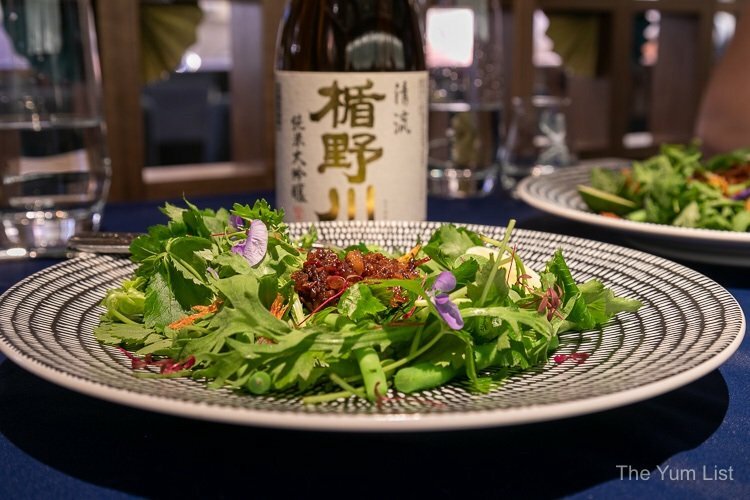 The little fruitier, richer style Tatenokawa Junmai Daiginjo “Seiryu” smooths over the intense greenness of the dish while its whisper of honeydew melon plays well with the sweeter dimensions of the sauce. And what would a nod to Malaysia be without a plate celebrating the ubiquitous Maggi instant noodles? The presentation brings smiles all around. 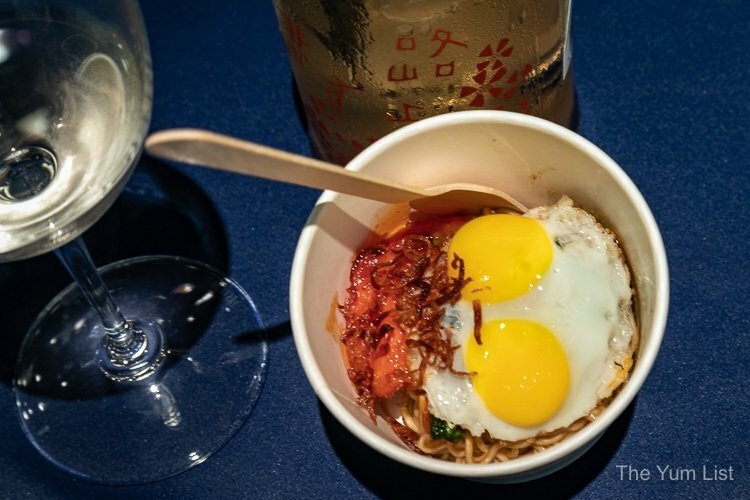 Paper cups and wooden forks hold the food with the obligatory fried egg on top. 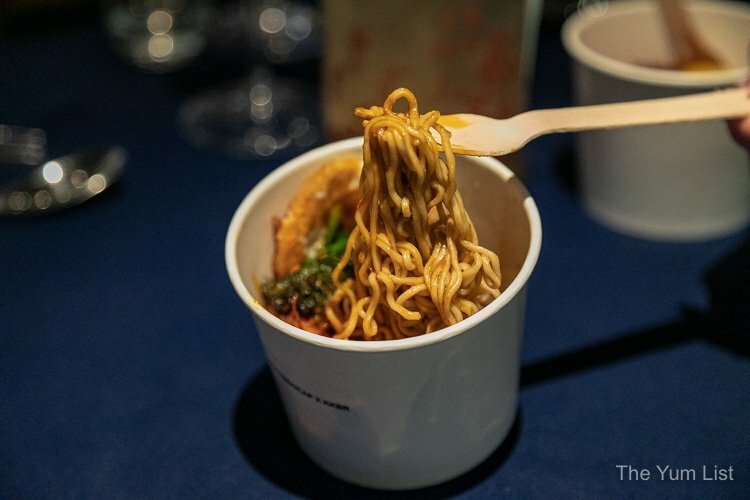 Momoya Seaweed “MSG” Maggi Goreng takes the popular seaweed paste from Japan (similar in popularity to Vegemite in Oz I’m told) – salty and aromatic – and tosses it through the instant noodles. It’s marvellous how much warm laughter is elicited with the serving of the second course at each table. As this combo is quite rich, the Kotsuzumi Junmai Daiginjo “tohka” sake is a good choice. 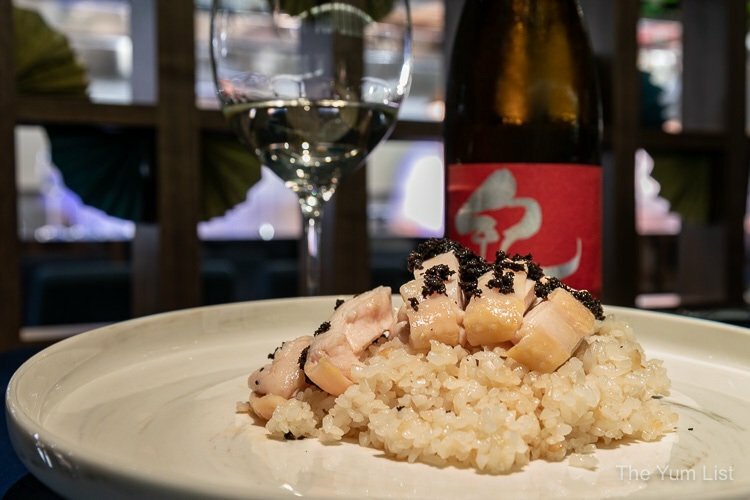 50% of the rice is polished developing both the richness and fruitiness of the sake, which stands well beside the bolder flavours of this plate. Guests have a choice of meat or poultry for dinner: a ramli burger or chicken rice! 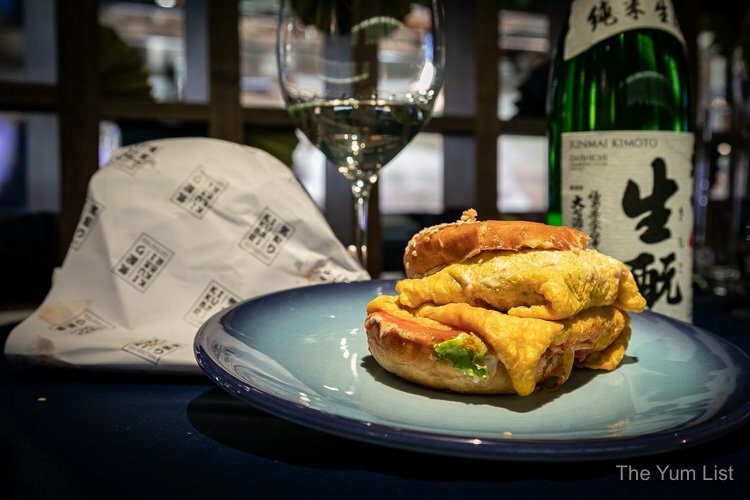 Wagyu tamago ramli burger “special” lushes up the famed Malaysian street burger with a wagyu beef patty. 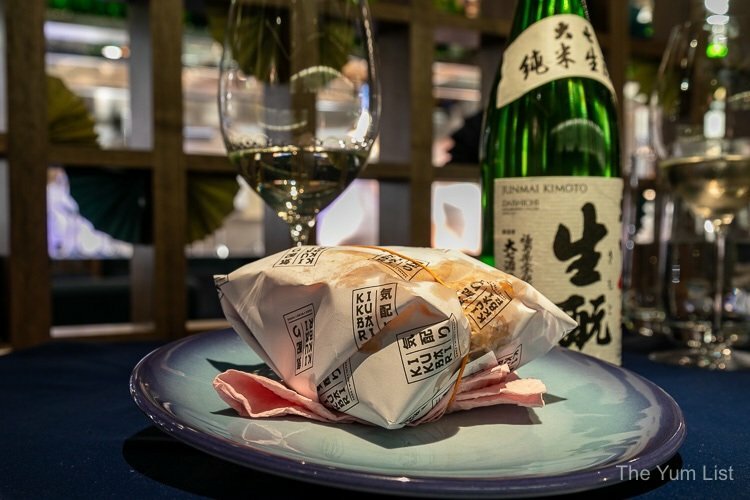 The compulsory egg makes it “special” and the white burger bun comes with its very own Kikubari paper wrapping fastened with an elastic band atop a cheap pink napkin for authenticity – just as you’d grab it straight from the hand of a street vendor. The beverage partner, Daishichi Kimoto Junmai is an unpasteurized sake. The traditional process produces more body and aromatics. Fortified wine is faint on the nose and this style is suitable for meat dishes or recipes that are oilier and richer. 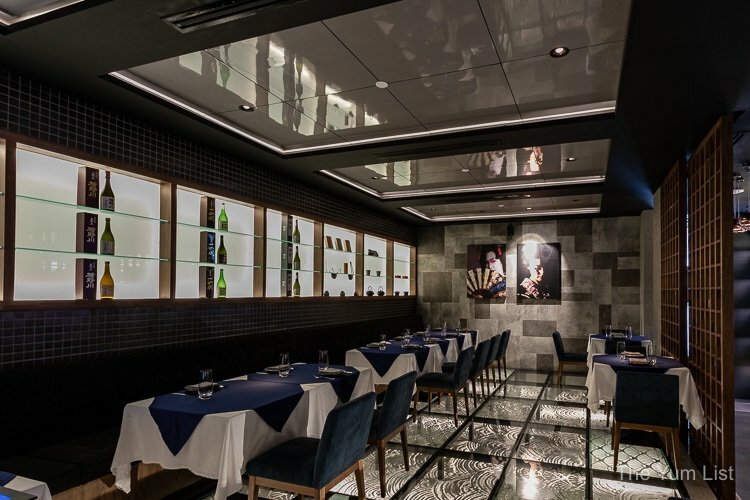 Most restaurants have goals of refining their food to fine dining quality. Tonight, though, it seems that Kikubari is reversing the order and making mamak their mission. 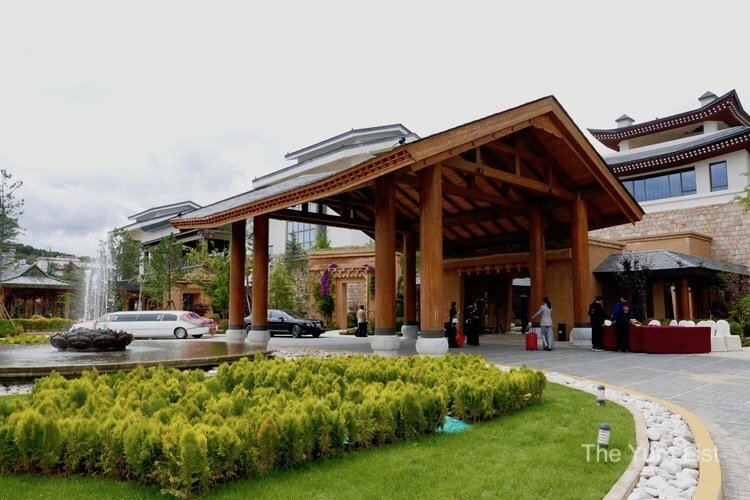 Chef Nik’s words resonate “We want you to have fun,” as we fondly listen to laughter at the tables neighbouring us. Kikubari Style “Hainan” Truffle Chicken Rice looks deceptively simple and just like the beloved Hainanese local dish. The usual suspects of chicken stock, ginger and pandan flavour the short-grained rice (traditionally long grain is used) and the poultry has been sous vide to attain exact juiciness and texture in the customary manner but the chicken jus has been given a glamorous twist with truffle paste. It looks dark and soyish but once on the tongue, the earthiness develops and it’s clear that this is no ordinary chicken rice. The pairing with KID Junmai Ginjo offers both a little bit of dryness but also a soft fruitiness. 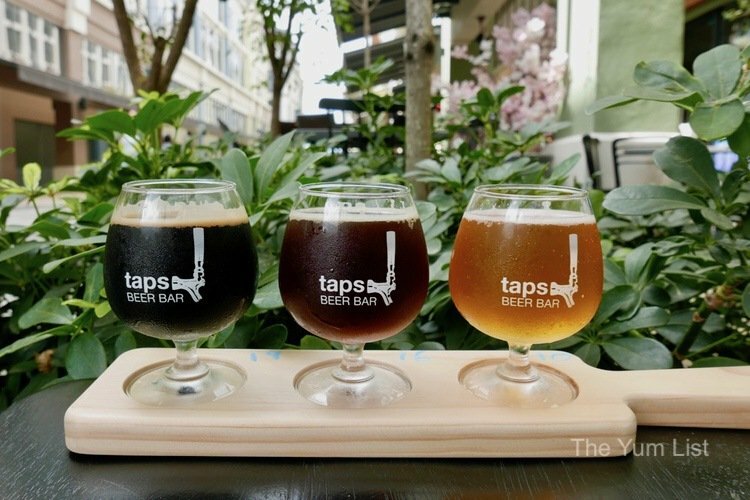 The earthiness of the truffle is managed gracefully with this well-balanced beverage. I just love it when the menu lists “first dessert,” as it means there must be more than one! Gula Malacca shiratama with caramelized banana and taro ice cream is a fun play on Japanese mochi (the glutinous rice dumpling), which is often paired with peach or mandarin, instead paired with the Malaysian flavours of banana, strips of jackfruit and the purple root veg. A drizzling of gula Malacca syrup is poured over to taste. 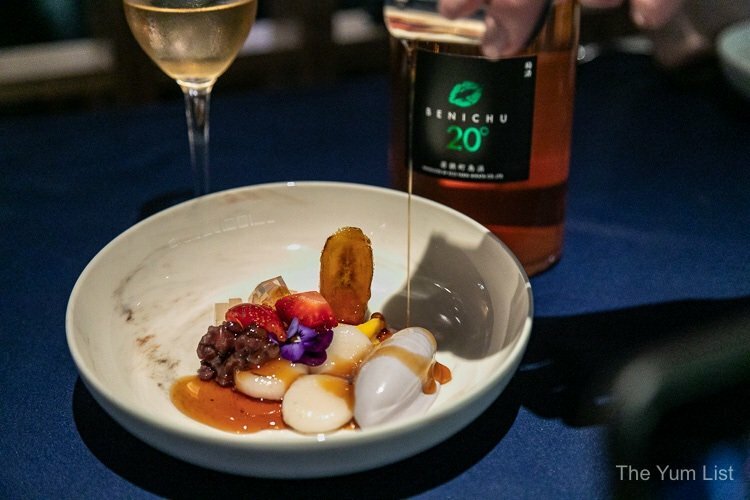 Plum liquor from Japan, Benichu Umeshu 20, has a lovely stone fruit character with peach and nectarine in the forefront. While it has its honeyed relish it’s not syrupy and rather clean on the palate. Milo “kaw-kaw” crème brûlée is possibly the most irresistible memory-inducing dish on the menu. Just as “kaw-kaw” suggests, it is super Milo-ed up. Milo crème brûlée is torched to perfection with little Milo nuggets, Milo cereal and Milo powder topping it all off. This is one case where the ingredients are not so refined but the technique certainly is. If Milo was a significant part of your childhood, this will surely please. 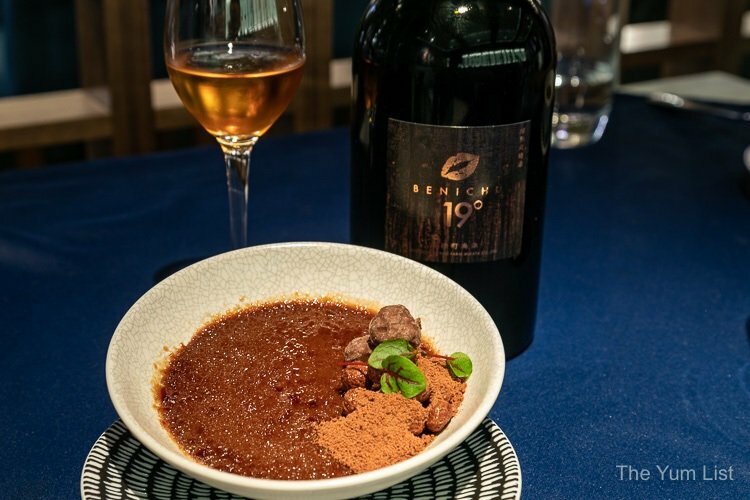 Barrel-aged plum liquor, Benichu Umeshu 19, offers more of a caramelized character than the previous drop. It plays well with the caramelised topping of the crème brûlée. As mentioned, this special Celebrating Malaysia dinner is available for this week only. Bookings are necessary and please note that the restaurant has a smart casual dress policy and is not an ideal place to bring children. Reasons to try the Celebrating Malaysia menu: fine dining turned street food and street food turned fine dining; a fun fun fun (and delicious) experience. Check out Kikbuari’s regular menu here and also their meat-free Monday specials too. The dishes sure do not look all that familiar. Interesting twists. Agree with you. This is not ideal to bring children. The price for these food… as a stay-at-home mother of two, for sure I won’t be able to afford it. Haha.